Cheltenham Science Festival is one of the UK's biggest science fairs, offering six days of debate, discovery, experiments, enjoyment and hands on fun that allow the public to explore the latest scientific research. This year two groups from the Medical Sciences Division are attending the Fair to bring their science to the public. From the 5-7 June, researchers from the Paediatric Neuroimaging group in the Department of Paediatrics will be running activities around treating and measuring pain in infants, a topic which generates immense public interest and challenges medical assumptions. 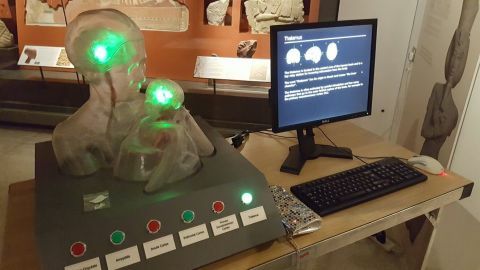 Using life-size infant and adult brain models, researchers from the group will give the public the opportunity to see how the human infant brain develops and interacts with the outside world and understand the dramatic structural changes that occur in the human brain throughout early development. A life-size interactive sculpture will also be on display, demonstrating how adults and infants experience pain, and the group will also use virtual reality technology to allow participants to see how our brain responds to events in our external environment. An animated film about infant brain imaging will reveal how you can better understand what happens in a baby’s brain when they are experiencing pain. Virtual reality technology will also be in evidence as researchers from the Radcliffe Department of Medicine present their Folding Genome activities at the Festival from the 8-10 June. These activities - which debuted at the Royal Society Summer Science Exhibition last year - reflect research in the department which uses a unique blend of virtual reality and innovative genetic techniques to understand how DNA folds- and how mistakes in this cellular origami can cause diseases such as diabetes and anaemia. The software developed for this - CSynth - is designed to provide an engaging way to explore and understand the complex structure of the genome in 3D, by integrating data from genome sequencing, computer modelling and high powered microscopy. Visitors to the Festival will be able to use this software manipulate DNA in virtual reality, seeing first-hand how changes in DNA folding influence the way our bodies work. A set of interactive touch screens and table top activities will also be at hand to explain and engage the public with this cutting-edge research.